Handcrafted with berry clusters and assorted fall foliage. Measures 22-24 inches diagonally across and 5-7 inches deep. UV rated silks are approved for outdoor use. For best longevity, keep out of direct sunlight and rain. 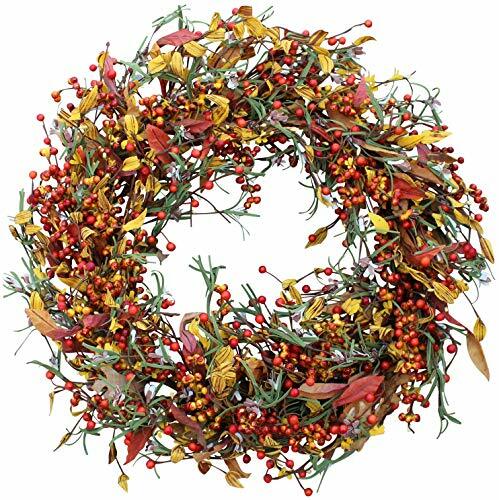 ELEGANT AUTUMN BERRY AND FOLIAGE WREATH - Handcrafted elegantly with berry clusters and silk fall foliage on a thick natural grapevine wreath base. BEAUTIFUL WHITE GIFT BOX INCLUDED - Not only is the wreath beautiful, but it comes with a white storage box that can be used year after year to store your wreath when the season is over. MEASURES TRUE TO SIZE - Measures 22-24 inches diagonally across and 5-7 inches deep. APPROVED FOR COVERED OUTDOOR USE - UV rated silks are approved for outdoor use. For best longevity, keep out of direct sunlight and rain. BUILT-IN HANGING LOOP - Your wreath will be easy to hang on your door wreath hanger of choice right out of the box with the built-in loop. No more dealing with wreaths falling off your door! If you have any questions about this product by The Wreath Depot, contact us by completing and submitting the form below. If you are looking for a specif part number, please include it with your message.